For some, nothing says “I love you” better than something homemade. For others, the way to their heart really is through their stomach. Why not cater to each of these love expressions by making a really yummy and seriously Valentinesy kind of dessert. Pink and red, red and pink! Chocolate accents, sugar and heart shapes! Strawberry roses!!! 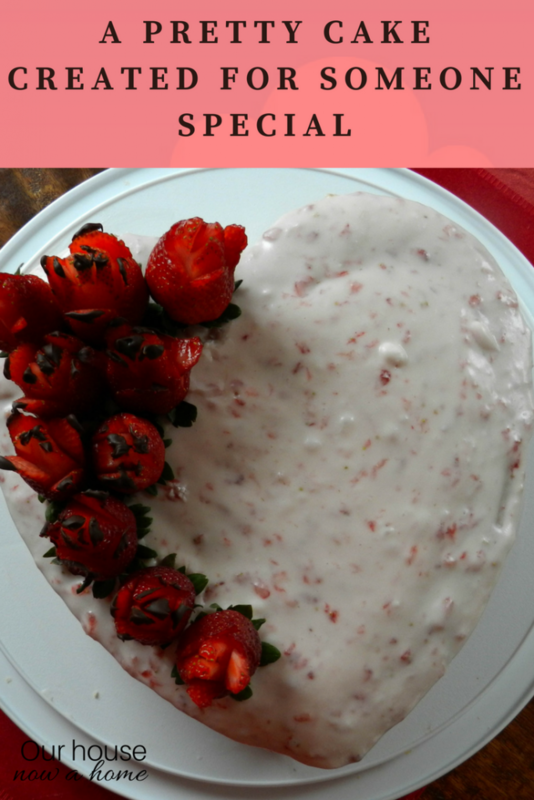 There’s no mistaking that this Valentine’s Day Heart Cake was meant for that special someone to celebrate what they mean to you. I’m a bit of a procrastinator. 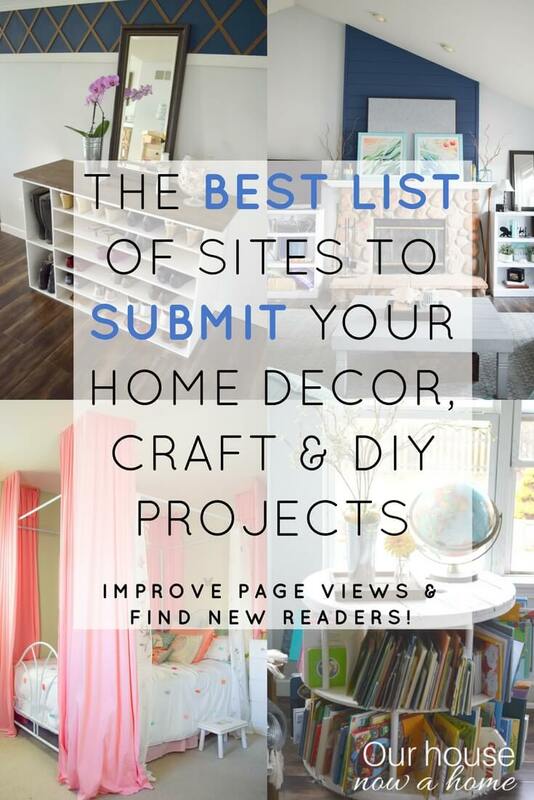 That doesn’t help much when I need to make something special for my husband or my small sweethearts. Valentine’s Day always seems to catch me off guard. Even worse, this year it happens to fall on a weeknight. 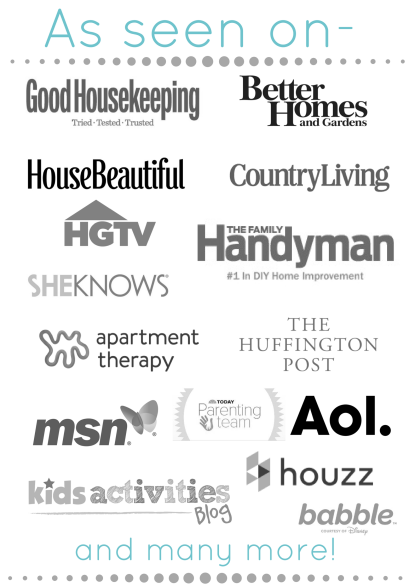 If you’re like us, our family can get so busy that it’s tough to do much more than buy candy and a card. This year can be different though. 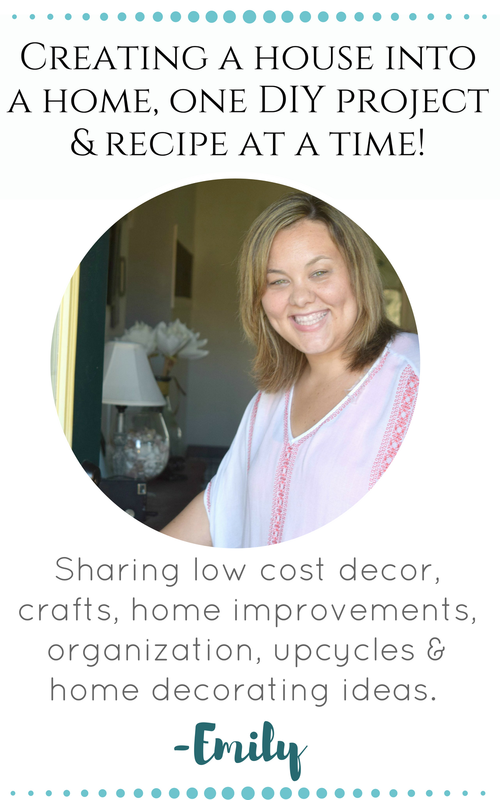 I have some ideas that can help you be on top of it and prepared in advance so that you’re not scrambling after a long day of work or after school activities. This dessert can be prepared a day or two before you want to serve it. So the fun part is making the cake from scratch (well that’s just me) or you can opt for the box variety to save you time. The pretty part is the frosting finish and the special strawberry roses that we are going to make for the top. I use your basic yellow cake recipe with a hint of cinnamon and frost with a strawberry butter cream. 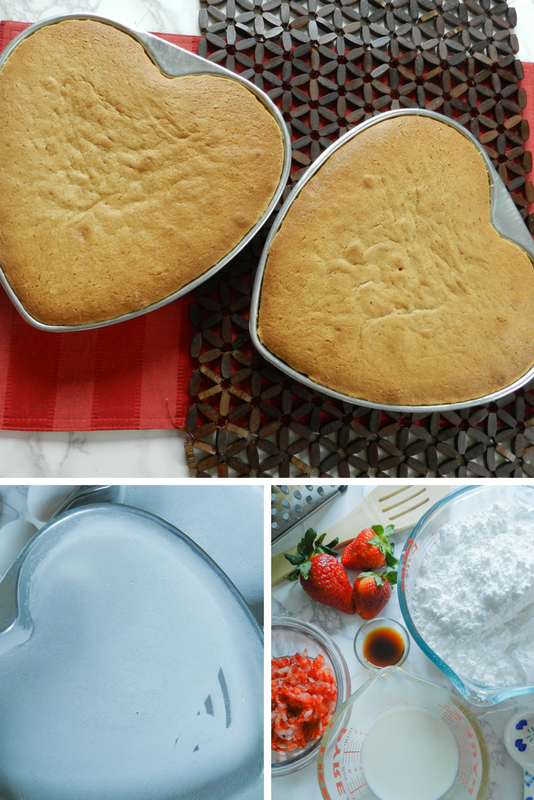 It’s really easy to make a heart shaped cake, even if you don’t have the heart shaped cake pans. 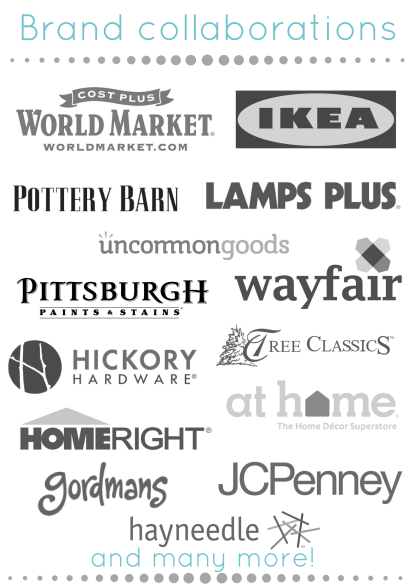 I just happened to find my pans at the local thrift store (check yours out! They have a lot of Valentine’s items available). If you happen to have heart pans, great! This recipe will give you enough to fill two pans and make a double layer cake. If you don’t have the heart shaped pans, don’t fret! All you need to do is grab your regular round cake pan and one square 8 x 8 pan. You will bake half of your cake mix in the square pan and the other half in your round pan (filling them to about the same height). When they are done, cut your round cake in half, turn your square cake so it’s angled like a diamond and put each half of the round cake along the upper straight edges of the diamond. This will yield a large single layer heart cake. Viola! So you’ll want to prepare your cake pans by greasing (I use a little coconut oil to do this) and lightly flouring them. Preheat your oven to 375 degrees. Next, combine the flour, baking powder, salt and cinnamon in a medium bowl. In another large mixing bowl, beat together softened butter, sugar and vanilla. Beat it with your mixer for about 1 minute until it has a nice light texture. Add your eggs to the sugar mixture and mix well for about one minute. Add about half of the dry mixture and half of the milk to the large mixing bowl. Mix until well combined and then add the remaining dry mixture and remaining milk. Beat on a low speed until it is all well combined. Pour the cake batter evenly into two cake pans (round and square pan to create a heart as directed above or two heart shaped cake pans). Bake at 375 degrees F for 30-35 minutes or until a wooden toothpick comes out clean. Allow your cakes to cool completely for about 15 minutes before removing them from the pans. Carefully remove the cakes and finish cooling them before adding frosting and strawberry details. 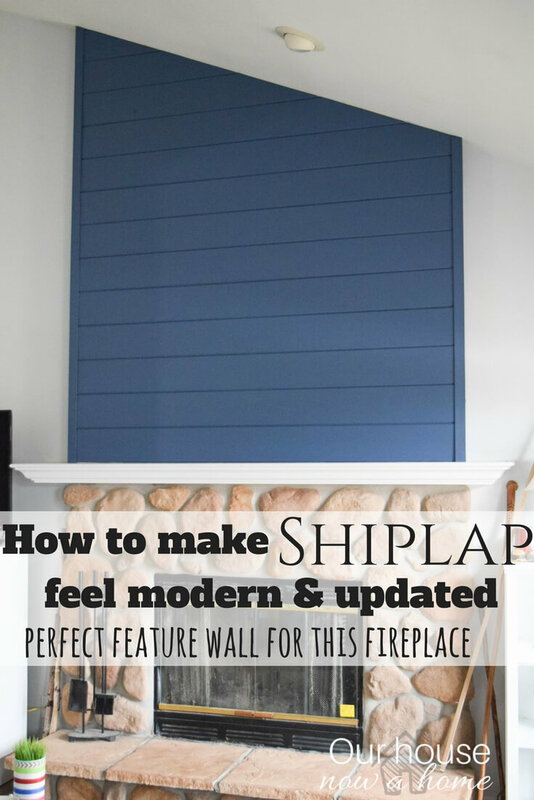 Take a look at the video tutorial to see how I made this. In a mixing bowl you’re going to want to beat the butter until its nice and fluffy. Add in about 2 cups of the powdered sugar and beat very slowly. Add in the 1/4 cup milk, vanilla and strawberry and continue to beat. Slowly add the remaining 2 cups of powdered sugar. If needed, add a pinch more milk to get your frosting to the desired spreading consistency. This amount of frosting will cover the tops and sides of both of the cakes you just prepared. These really aren’t that hard to make. I like to drizzle a little chocolate on them to add to the pretty and tasty part. What’s better than chocolate covered strawberries? Chocolate covered ROSE strawberries. Hey, you could even make a dozen of these and put them on longer skewers in a vase. Cheaper than the original long- stem rose and tasty too! I make as many as I can and add them to the top of our heart cake as a special little surprise. It’s always a win! You will need a paring knife and some toothpicks. wash and dry strawberries well. Keep the greenery! The leaves add to the “rose” effect. Start at the base (or bottom) of the strawberry and make a small slit. Do not cut all of the way through. Use the paring knife to gently roll the tip of the petal back away from the rest of the strawberry. 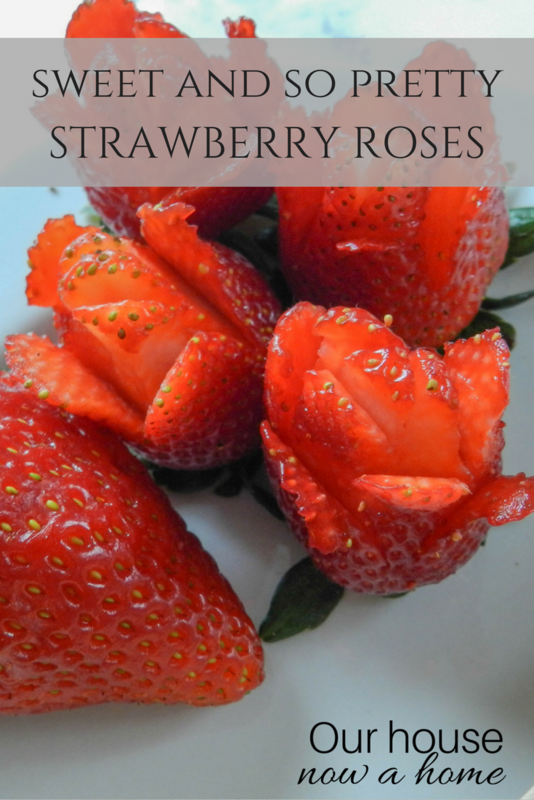 Gently curl these new petals away from the strawberry. Continue up the rose cutting as many layers as you can or want. At the tip make a slit and gently fold the ends to curl the halves away from each other. Insert a toothpick into the base of your roses and gently stick them into your frosted cake. 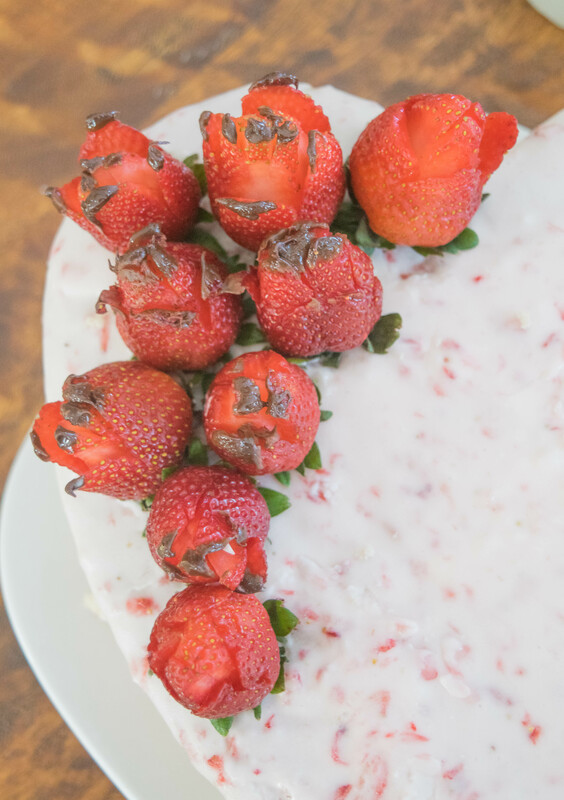 I like to cluster the strawberry roses on top of the cake, but you can add them to the cake any way you like. Here’s the video that helps show the steps for the cake and the roses as I outlined above. 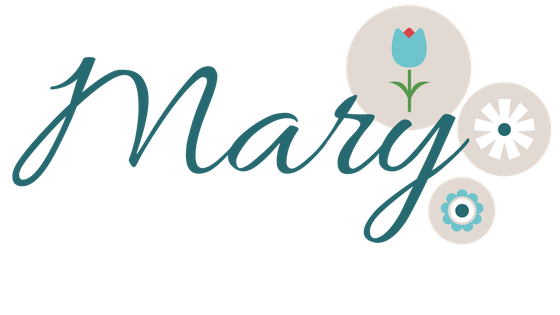 I hope you enjoy this pretty little creation and I hope that it was fun and easy to make. What else do you like to do for Valentine’s Day? This is such a delicious treat. 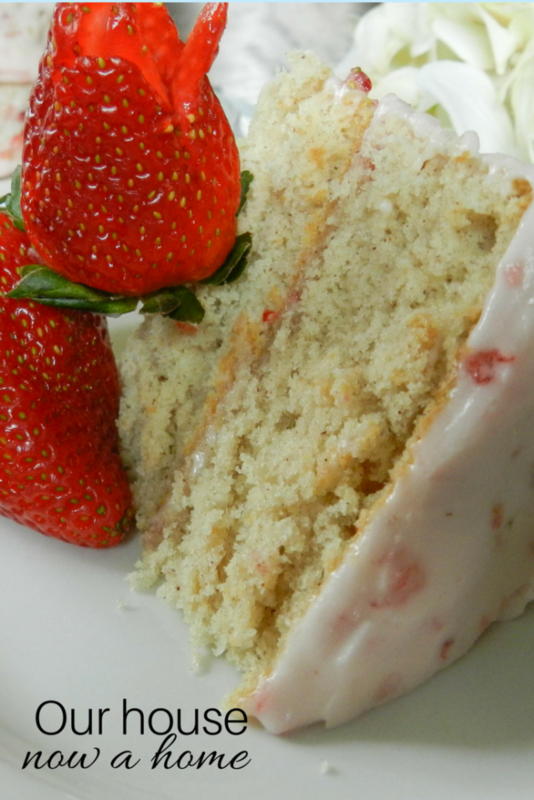 The homemade cake is wonderful and the icing has a fabulous strawberry flavor to it. This one will be a win every time. Step-by-step instructions make this a very simple recipe to make. So you'll want to prepare your cake pans by greasing (I use a little coconut oil to do this and lightly flouring them. Preheat your oven to 375 degrees. Next, combine the flour, baking powder, salt and cinnamon in a medium bowl. In another large mixing bowl, beat together softened butter, sugar and vanilla. Beat it with your mixer for about 1 minute until it has a nice light texture. Add your eggs to the sugar mixture and mix well for about one minute. Add about half of the dry mixture and half of the milk to the large mixing bowl. Mix until well combined and then add the remaining dry mixture and remaining milk. Beat on a low speed until it is all well combined. 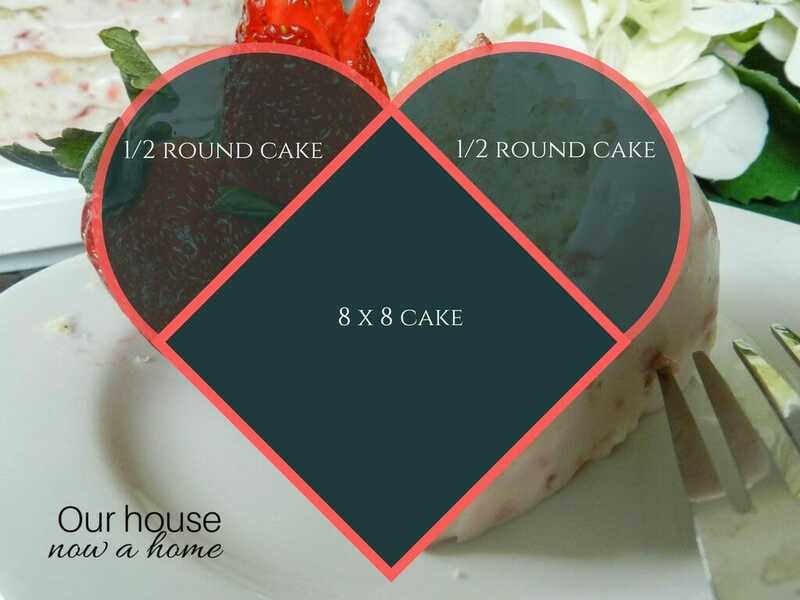 Pour the cake batter evenly into two cake pans (round and square pan to create a heart as directed above or two heart shaped cake pans). Bake at 375 degrees F for 30-35 minutes or until a wooden toothpick comes out clean. Allow your cakes to cool completely for about 15 minutes before removing them from the pans. Carefully remove the cakes and finish cooling them before adding frosting and strawberry details. In a mixing bowl you're going to want to beat the butter until its nice and fluffy. Add in about 2 cups of the powdered sugar and beat very slowly. Add in the 1/4 cup milk, vanilla and strawberry and continue to beat. Slowly add the remaining 2 cups of powdered sugar. If needed, add a pinch more milk to get your frosting to the desired spreading consistency. This amount of frosting will cover the tops and sides of both of the cakes you just prepared. Wash and dry strawberries well. Keep the greenery! The leaves add to the "rose" effect. 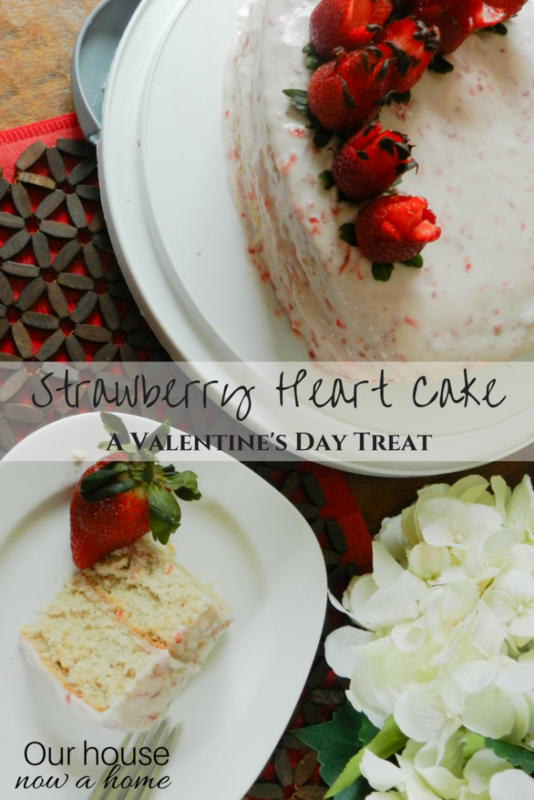 A heart-shaped strawberry cake is perfect for Valentine’s Day. I usually make heart shaped cookies, but I may have to try your cake. It’s so pretty and looks delicious. Looks like a really declines cake and frosting to make for Valentines Day. I don’t have a heart shaped pan but know how to cut the cake so it will look like a heart. This is such a pretty cake! I might have to make a heart cake for Valentine’s Day. We all love cake in this house and this seems easy enough. That would be a fun Valentines cake to make. 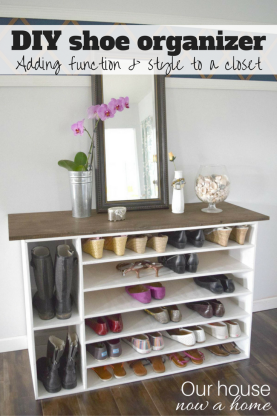 We will be traveling on Valentine’s Day but this will be fun to make before we leave. It looks delicious. I like that you provided 2 different versions of how to create the cake. It will have lots of people getting creative this Valentine’s Day. This is one pretty cake! I love that you made it into a heart shaped one, perfect for Valentine’s without a doubt! I also love the strawberries, those are one of my most favorite fruits! Nice recipe. 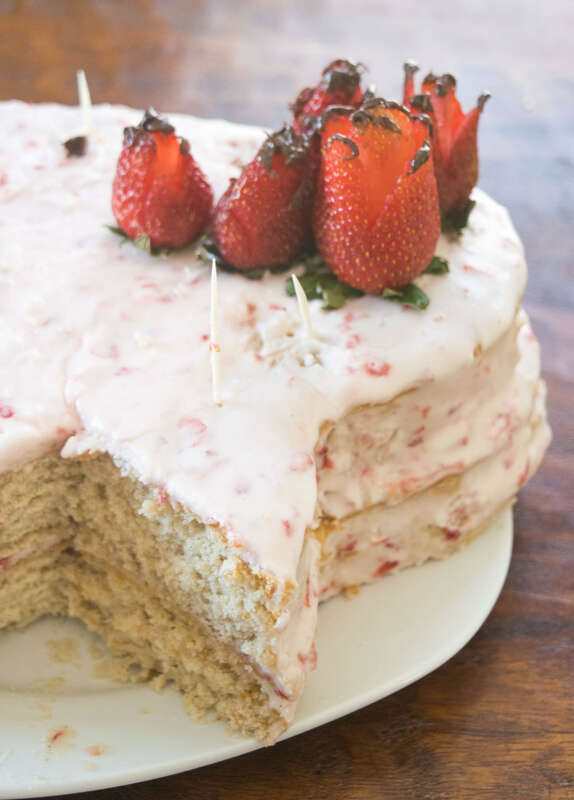 That strawberry frosting looks delicious and reminded me a bit of pop tart frosting! This looks so amazing! I know my guy would love it as he snacks on strawberries any chance he gets. This is such a beautiful cake. I love the idea of a heart shaped cake for Valentine’s Day. YUMMY!!! 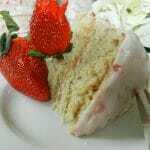 I do enjoy a good cake and one with strawberries is so good. I am loving the roses as well super cute and creative. The cake looks great! This is definitely something I would make with my youngest daughter who loves to cook. 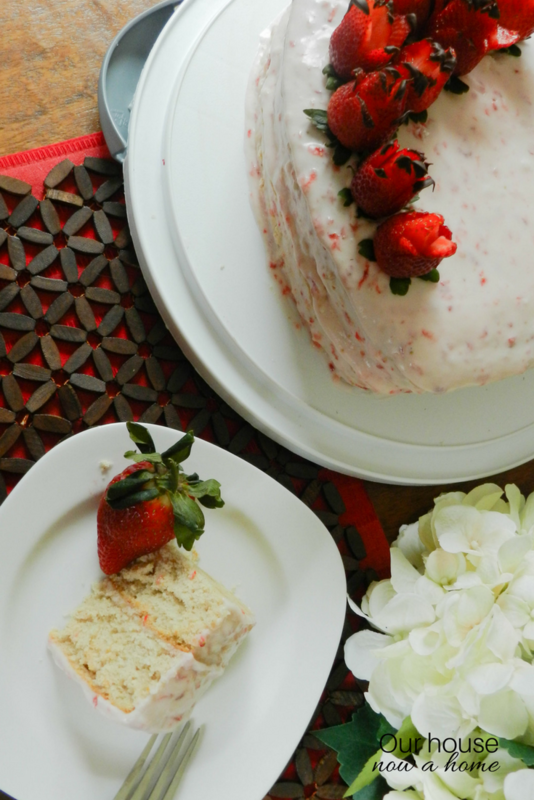 The strawberry roses are such a cute touch on the heart shaped cake. This is the perfect Valentine’s Day dessert. Aww, heart-shaped pans totally take me back to my childhood. I don’t have one but I should definitely consider getting one! I love strawberries! This looks so yummy. I’m sure my family would love it. Oh my goodness! Strawberries have always been something that I’ve associated Valentine’s Day with. Whether chocolate covered or plain. I love strawberries, so strawberry cake would totally be welcome! Oh my goodness I just fell in love! How beautiful is this cake and I can image so yummy. I need a slice! 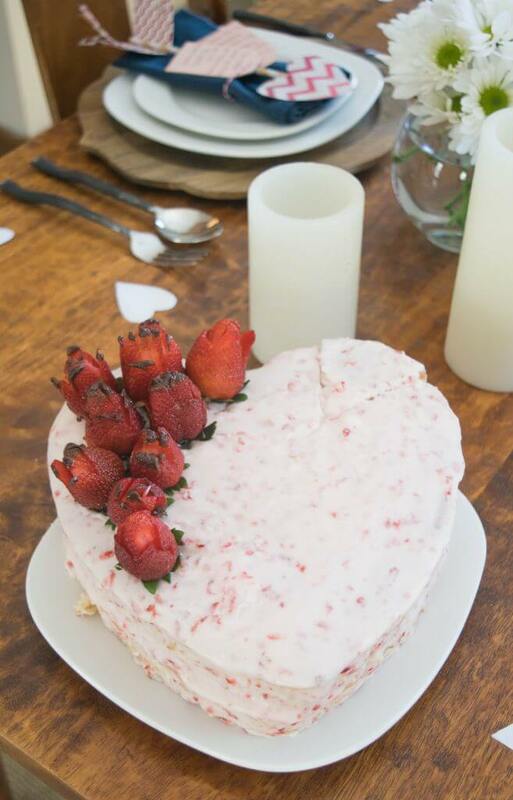 Absolutely love the heart shaped cake! I don’t have any pans in this shape so your guide will help me create the perfect cake without having to go out and buy one! 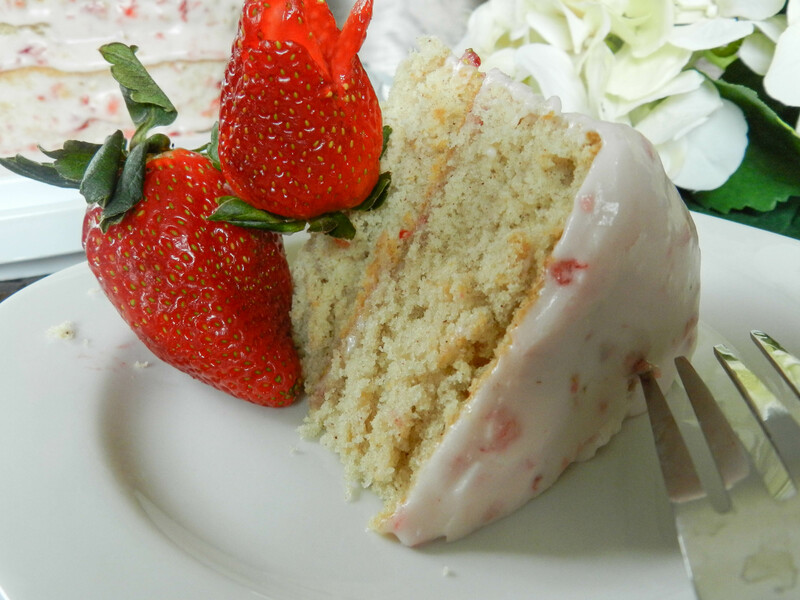 Strawberry cake is my mom’s favorite. I will make this for her. She will be so happy and it would really cheer her up. She’s recuperating from surgery and baking her this cake is surely going to lift her spirits. This recipe looks very delicious! I love the frosting you chose to use! I might have to surprise the kids with this one! It looks super tasty!